From left to right, back: Ellen Crosby, Meredith Cole, Ellen Byerrum. Front: Me, Sandra Parshall, Donna Andrews. Reston Library, May 24, 2011.
and maybe a nice map. G. M. Malliet delivers all that in WICKED AUTUMN." My interview with William Kent Kreuger. With Marcia Talley at left. We're all dressed up for the annual dinner of the Mystery Writers of America, where the Edgar awards are presented. At the Sisters in Crime meeting in Silver Spring, Maryland. Twenty-seven local authors briefly described their latest projects. Also pictured - sort of - is author Art Taylor. 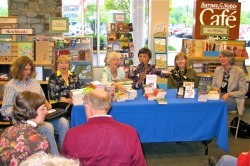 L-R - Elaine Viets, Mary Jane Maffini, Rhys Bowen, Marcia Talley, me, Louise Penny. Clockwise from top: Author Rhys Bowen, me, Brian Skupin, and Kate Stine at the breakfast for debutante authors and fans of honor. Brian and Kate are the publishers of Mystery Scene Magazine. Deb Baker, Joanna Campbell Slan, and me. The short story panel: Moderator Hariette Sackler, G.M. Malliet, Marcia Talley, Roberta Isleib, Maurissa Guibord, Toni Kelner (the Agatha winner for short story), John Betancourt, Kaye George. Above photo courtesy of Kaye George. 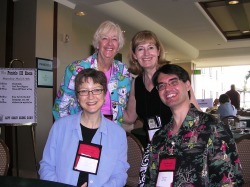 The New England chapter of Sisters in Crime maintains a helpful list of mystery conferences. See the full listing here. 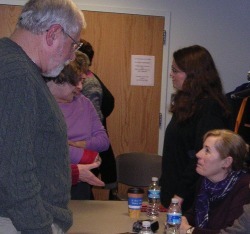 The photo at left is from the December 2008 signing at the Alexandria Library, Duncan branch, for the Chesapeake Crimes 3 anthology. Meriah Crawford is standing at right.